5th sentence, 74th page: Gravel crunched under her feet as she raced towards the house. Meggie loves books. So does her father, Mo, a bookbinder, although he has never read aloud to her since her mother mysteriously disappeared. They live quietly until the night a stranger knocks at their door. He has come with a warning that forces Mo to reveal an extraordinarily secret – a storytelling secret that will change their lives for ever. 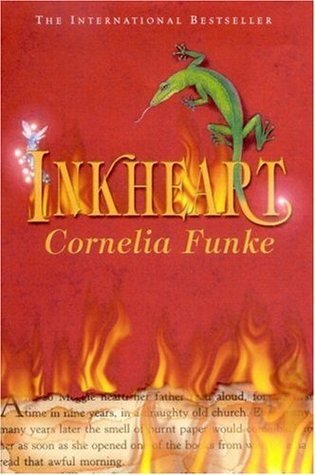 Inkheart is the thrilling new adventure from Cornelia Funke, the international bestselling children’s author of The Thief Lord. It’s a story within a story, where the imaginary becomes real. One of the things I love about this book is the way that each chapter starts. Each chapter starts with a quote from another book (most of which are now on my wishlist). These quotes not only set the theme for the following chapter, but they also highlight the different worlds that were entered again and again throughout this story. Not just the parallel story of Inkheart throughout, but the different tales that Meggie and Mo find themselves swept away in. I’m only realising as an adult that one of the things that I related most strongly to throughout this novel would was Meggie and Mo’s love of books. They are so hooked into the literary world that they are often unable and unwilling to relate to the real world around them. Something that I myself can relate quite strongly to. Actually, I kind of wanted Elinor’s house from the very first moment, and a number of years between readings really hasn’t changed my desires and impressions. Inkheart is a fantastic beginning to a new series. It has everything that you want in a story – action, adventure and a lot of heart. The villains are the type that are likely to make you cringe repeatedly, the protagonists people that you can immediately relate to. This is one of those stories that I look forward to passing on to my future (theoretical) children.